What is a woman supposed to be like? This is a fascinating question that has been answered in radically different ways over the course of history. But there must be an answer that works in all places and in all times. This post may contain affiliate links. Purchases made through these links help support the website. How does one determine what any given thing is supposed to be like? How do we know what a chair is supposed to be like, for instance? We determine what the purpose of the thing is. For a chair, the purpose is to be sat on. So, therefore, the chair which is best, is the chair that fulfills that purpose the best. A chair that has no seat would not be considered a good chair. A chair that had a spike sticking out of the backrest would also not be an ideal chair. These traits would prevent the chair from being sat on comfortably. Living beings, being more complex, have more complex purposes than chairs do. 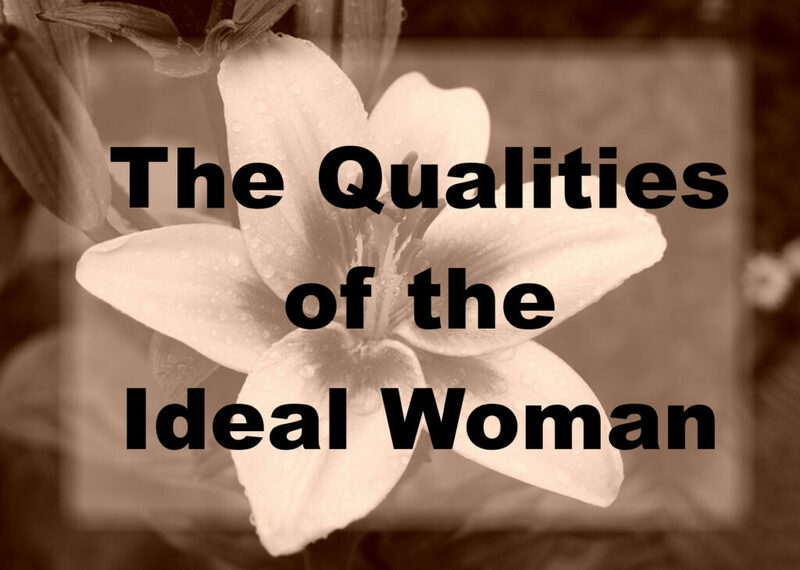 So, if we want to know what makes an ideal woman, we need to know what a woman is for. We know that she is a female of the human species, and like all humans therefore has some traits in common with animals of other species. Humans are not mere animals though, but are capable of culture, thought and altruism. Still, we can often learn about ourselves from the traits we share with animals, so it might be helpful to briefly study the traits of females of other mammalian species. The first and most obvious purpose of the female in any animal species is to provide one half of the reproductive equation. The male and female work together to produce offspring. If either is missing, the species does not continue. In the animal realm this is called mating. It is obviously necessary for the good of any species that reproduction occur. So, how can we apply this to humans, who are not mere animals, and have purposes beyond mere survival of their species? Because humans do have a purpose beyond reproduction, “mating” for humans has historically been enshrined in the institution of marriage, which is a cooperative lifelong endeavor. What qualities would a woman need in a marriage, or for that matter, in any relationship of trust and commitment? Cooperation is a necessity. Communication skills would also be necessary, as humans don’t act instinctively as animals do, but emotionally and rationally. Loyalty also would be important, as marriage requires trust to function well, and trust presupposes that each party will respect the other’s dignity, property and secrets. What else does the female do? In species as widely disparate as rabbits and gorillas, the female is also the nest builder. While pregnant rabbits dig a burrow, line it with grasses and other vegetation, and finally with their own hair, thus providing a warm, safe place for their helpless young. Among humans women are also usually the ones who create the environment for the children to grow up in. While rabbits are limited to their instinctive nest-building behavior, and can only make one kind of nest, and care for their children in only one way, human women on the other hand are capable of thought and artistic expression, and the homes they make are not merely shelters for the bodies of their family, but also homes for the mind. A good home is an environment which stimulates, forms, and civilizes those who live in it, and only a woman can make such an environment. To do this well, she will need many talents, like resourcefulness, using what is available to make something better; frugality, using what there is well; and last but not least, an appreciation for beauty. The ability to recognize and deliberately create beauty is a uniquely human trait, and one of the most important skills for a homemaker. The female in every species is also the one that gives birth to the young and nurtures them from her own body. She is provided with special organs which allow this. For humans, it is hard work, requiring endurance and patience to get through the pregnancy and labor, which require a special sort of toughness, but also gentleness and as it deals with fragile and helpless beings who require constant feeding, protection, and love. Once the young are beyond the helpless stage of infancy, they begin to learn the skills of their species. Female cats will teach the kittens how to hunt their own food by dragging dead prey back to the nest and eating it in the presence of the kittens, later she will bring back live prey for the kittens to experiment with. This is not particularly enjoyable to watch, but it is an important part of a kitten’s learning development. Finally, the mother cat will bring kittens along on a hunting trip and they will soon be ready to hunt alone. Chimpanzees will show their young how to build nests, and other species will teach their young the skills they need to survive. Humans however, need to do more than just survive. They have to build, think, connect, and grow in ways that other animals will never do. And human mothers have to be ready to teach their children how to do these things. As G.K. Chesterton put it in his entertaining book What’s Wrong with the World, she must “be Queen Elizabeth within a definite area, deciding sales, banquets, labors and holidays; be Whiteley within a certain area, providing toys, boots, sheets, cakes and books, be Aristotle within a certain area, teaching morals, manners, theology, and hygiene…” A challenging task to be sure! And she will need patience, tact, patience, wisdom, patience, and a strong sense of humor, if she is to do it well. While not all women want to become spouses or mothers, these same virtues, or good qualities—cooperation, communication, loyalty, reserve, resourcefulness, frugality, order, appreciation of beauty, kindness, endurance, patience, wisdom, and tact—are necessary to any woman who wishes to be a well-developed human. I like how you used examples that led into your point. Great work! !